Are you in need of a full-size SUV that can meet all of your driving needs on a routine basis? If so, head over to Charlottetown Toyota in Charlottetown, Prince Edward Island (PEI). 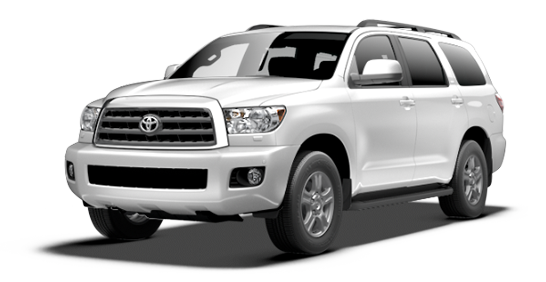 At our dealership, drivers can test drive a vast collection of new Toyota in stock including the 2016 Toyota Sequoia. As one of Canada’s premier Toyota dealerships, we have served PEI for a number of years with great deals on all Toyotas. Stop by Charlottetown Toyota at 1 Superior Crescent and discover a new Sequoia today. As a full-size SUV, the new Sequoia is equipped with a powerful powertrain. The SUV has a 5.7-L V-8 that produces 381 hp and 401 lb.-ft. of torque. The powerful engine is paired to a 6-speed Electronically Controlled Automatic Transmission that can send power to the rear wheels or all four with an optional Multi-Model 4WD system. When adequately equipped, the Sequoia can tow up to 3,356 kg. After experiencing how luxurious the Sequoia is, we’re certain that you’ll want to drive the full-size SUV on a routine basis. When utilizing all eight of the SUV’s seats, the last thing you want to worry about is everyone’s safety. To keep all of your passengers protected, the new Sequoia comes with a Star Safety System, a Blind Spot Monitor, an anti-theft system, front energy-absorbing crumple zones, front and rear parking assist sonar and more. If you’ve been searching for a full-size SUV that can take the place of a minivan, then check out the 2016 Toyota Sequoia. The new Sequoia has a powerful powertrain, a lengthy list of interior features and a long list of safety features to provide you with an enjoyable ride. To get our best price on a Toyota, visit Charlottetown Toyota in Charlottetown, Prince Edward Island (PEI). Come by Charlottetown Toyota at 1 Superior Crescent and test drive a Sequoia today.